Prior to the weekend the Sunday Tribune sent a series of questions to me relating to my brother Liam Adams. The paper did not publish the full response it was given but produced an edited version. I think it only fair that readers have a chance to read the full piece. For the last few weeks the Sunday Tribune has been accusing me of not answering questions, of ‘dodging and weaving’ and avoiding the issues which were being raised. These assertions were made by Suzanne Breen in various media outlets. What Suzanne Breen failed to say was that neither she nor the Sunday Tribune had asked me any questions. Neither did they ask me for an interview and no attempts were made to contact me. Neither Suzanne Breen nor any other Sunday Tribune journalist bothered to turn up at any of the press events I hosted. It was only when Sinn Fein briefed some journalists that our national Chairperson Declan Kearney was compiling a report of my brother Liam’s role in Sinn Fein for external as well as internal distribution, and after the Irish News carried this on Thursday, that your questions arrived. Sinn Fein received them on Thursday night. By Thursday morning our National Officer Board had already met to receive the report. The Party leadership structures were briefed on Thursday night that the report would be circulated to the membership on Friday morning and prior to its release to the media at lunchtime. From the outset Sinn Fein made it clear that Liam Adams had been a member of the party. And as soon as the party had the details of the nature and duration of his role within the party we immediately made it public. This process took a number of weeks to complete. Your newspaper’s offensive and almost hysterical treatment of a deeply complex, emotional family trauma falls far below objective journalistic standards. Your eagerness to attack me ignores the needs and rights of victims and survivors in my family and other family members who are private citizens. It also ignores the reality that court proceedings are pending. Media coverage of this case will almost certainly be part of the defence. The PSNI have written to me as a witness in the case. Three years ago after Aine went back to the police I also made a statement to the PSNI. The PSNI letter explicitly advises me to refrain from speaking to the media about the case as it could possibly prejudice any future trial. With this advice in mind I showed the questions from the Sunday Tribune to my solicitor Seamus Collins of PJ McGrory & Co. His advice is that he agrees with the contents of the letter from the PSNI that I should refrain from commenting further about these matters and he has advised me in the strongest terms not to respond to these questions. He believes that by answering the questions any future trial could be seriously compromised. Nothwithstanding this, it is my intention and with my solicitors advice in mind, to deal with the matters you raise on the basis that what follows is already in the public domain. Party Chairperson Declan Kearney has dealt with those questions that are a matter for the party directly and which were addressed in a report which he compiled over the last number of weeks and which was presented to Ard Chomhairle members on Friday morning. My focus has been to ensure that due process takes place and that justice is done. My concern throughout has been for my niece. The decisions I took and the approach I adopted were taken on the basis of the professional advice I was given in seeking to help Aine and the experience that I and my brothers and sisters acquired in coping with the consequences of my fathers serious abuse of some of our siblings. This professional advice and experience convinced me that my role was to support the victims, protect the victim’s right to anonymity - while that was their wish - and to help bring closure and empower victims and their relatives. Consequently, I did not tell anyone in Sinn Fein of the allegations. There has been no cover up by Sinn Fein. The party did not know of the allegations against Liam Adams. Therefore it could not take any action even within the party’s rules and regulations. It did nothing wrong. Neither was there any cover-up by me. The facts are straightforward: when Aine made her allegations against her father it was one of my family members who accompanied her and her mother to the Social Services. The RUC were also informed. The statutory bodies with responsibility for dealing with child sexual abuse know of these allegations. The manner in which they then dealt with this requires scrutiny. The Sunday Tribune has conducted no such scrutiny. The RUC received a complaint of sexual abuse of a minor. What did it do? Three years ago Aine decided to go again to the police. I also made a statement to the PSNI. I am therefore a witness in a pending court case involving my brother. After the allegations were levelled against my brother, I only became aware on one occasion of his membership of the party. That was in 1997 when I heard that he was thinking of putting his name forward as a candidate. I blocked that and moved to get him to withdraw from the party. I was not aware that he later involved himself with Sinn Fein in Lower Andersonstown. His decision to do this was reprehensible and deplorable. Had I known I would have acted to have him leave the party. Over the years I had occasion to meet Liam. I volunteered this fact in a part of the UTV Insight programme that was not broadcast. Though I was estranged from Liam I never denied being in contact with him on family or other occasions. I used some of these opportunities to speak to him about Aine’s situation. During this time also only a small number of my family members knew of the allegations against Liam. For me not to have participated in significant family events for him would have raised questions and risked breaking the confidences I had given. It would also have hurt other members of his family. As I told the UTV Insight programme I informed his second wife of the allegations against Liam. I did not think it was appropriate for him to be canvassing during the Dail election in 1997 and I told him so afterward. In respect of references to him in my book ‘Before the Dawn’ which deals with my life growing up in west Belfast , I included references to other siblings also. My account of my childhood memories is exactly that. It would have been highly irresponsible and wrong of me to make any reference to the allegations against Liam in the book. Your information is incorrect. I did not say that I informed both youth projects. When he worked in the Clonard Youth Club I tried to get him to leave and when he wouldn’t I ensured that the authorities in Clonard were made aware of the allegation. It has also since transpired that the RUC cleared him to work in this project despite being aware of the allegation. In the case of the Blackie I approached him myself and told him to leave the job or I would go to the management of the project about the allegations. In this instance, he eventually resigned his position. It has also emerged that the PSNI cleared him to work in this project despite being aware of the allegation and in the face of radically changed legislation imposing more stringent checks. During this time I was trying to facilitate a process between Liam and his daughter Aine. My approach to this and other family matters was guided by professional advice and also by experience and that of my brothers and sisters in coping with my father’s abuse of family members. The professional advice was to support the victims, protect the victims right to anonymity, while that was their wish and to help bring closure and empower victims and their relatives. This is what I sought to do at all times. We will be forever indebted to the professional counsellors who helped us. Finally, any professional in this field will tell you that confidentiality is a critical consideration. This right extends also to members of my family and their dealings with counsellors and other professionals helping us deal with this trauma. Over the last number of weeks Sinn Fein Chairperson Declan Kearney has compiled a report relating to the nature and duration of Liam Adams’ membership of Sinn Fein. Following the UTV Insight programme we acknowledged that he had been a member of the party. Having spoken to Gerry Adams, national party leadership, party members and examining available documentation we have established the following facts. 1. 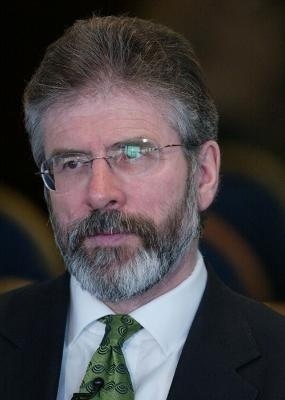 When did Liam Adams join Sinn Fein? The first record of his membership is a cumann in Donegal in the mid 1980s. 2. What cumainn was Liam Adams a member of? As far as we can establish he was a member of a cumann in Donegal for a short period in the mid 1980s, in Dundalk for a period in the 1990s and in Lower Andersonstown in Belfast from 2000 for a number of years. Sinn Fein was not aware of the allegations against Liam Adams. Clearly he should not have been a member of the party. 3. What officer positions did Liam Adams hold in Sinn Fein? He was chair of the Louth Comhairle Ceantair for two and a half months in 1996. He held the position of secretary for one month before this time. He was also nominated as Education Officer but he did not take up this position. He held a number of positions in a local cumann in Lower Andersonstown including Chair for a short period. 4. How long was Liam Adams chairperson of the Louth comhairle ceantair? He was chairperson of Louth Comhairle Ceantair for two and a half months in 1996 and he was appointed as secretary for one month. 5. Who nominated and seconded him for that position? 6. According to Sinn Feins constitution, the Comhairle Ceantair liaise with Sinn Feins head office. With whom did Liam Adams liaise? We have no record of any contact between Liam Adams and the party’s Head Office. The reality is that this function is normally performed on behalf of a Comhairle Ceantair by the relevant regional leadership structure overseeing local executives. Liam Adams was also only in this position for two months. 9. Before Dundalk, was Liam previously a member of Dublin Sinn Fein and/or associate with party members in Dublin? As far as we can establish he lived in Dublin for a year or two in the early to mid 1980s. He was not a member of Sinn Fein but did attend republican events. 10. Did Liam attend ard fheiseanna as a delegate and if so when? We dont know. Party records only go back to 1997. He was not a delegate after that date. 11. Did Liam speak at ard fheiseanna and if so when and on what subjects? Head Office only retains records of keynote leadership speeches and key Ard Chomhlaire contributions. We do not keep records of each individual contributions at Ard Fheiseanna. 14. Was Liam involved in fundraising for Sinn Fein in any capacity? He was Treasurer of the Lower Andersonstown cumann for a period and was a joint signatory on the cumann’s cheque book. 15. After Liam moved from Dundalk to Belfast, was he active in Sinn Fein in Belfast, and if so in what role? From 2000 and for a number of years Liam Adams involved himself in localised party work in Belfast. Liam Adams did not re-apply to join the party as would be required by party procedures. He held a number of positions in a cumann in Lower Andersonstown, including chair, treasurer and other subsidiary roles for short periods. 16. Was Liam ever in Leinster House as a guest of a Sinn Fein politician? You have accused Gerry Adams of breaking the Sinn Fein constitution which you claim states when a member becomes aware of sexual allegations against another member they are bound to inform Sinn Fein Ard Chomhairle whilst maintaining the anonynimity of the accused. This is not in the Constitution nor is it accurate. Robust guidelines were adopted by the Ard Chomhairle in 2006. These make it clear that the nature of the allegations and the identity of the accused should be communicated to the statutory agencies immediately as well as the relevant party structure. If the accused is a Party member, he/she is immediately suspended without prejudice by the National Party Chair pending the conclusion of the appropriate statutory investigations.